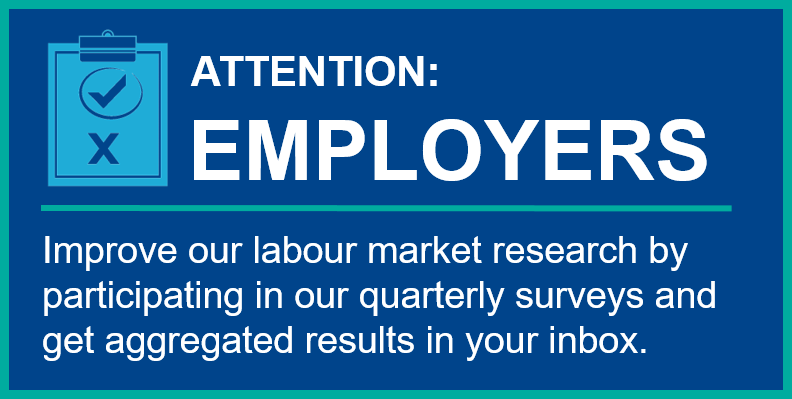 Workforce Profiles look at the people behind Workforce WindsorEssex’s 120+ In-Demand Jobs. Each week, we talk to a different professional for an inside look into their work. 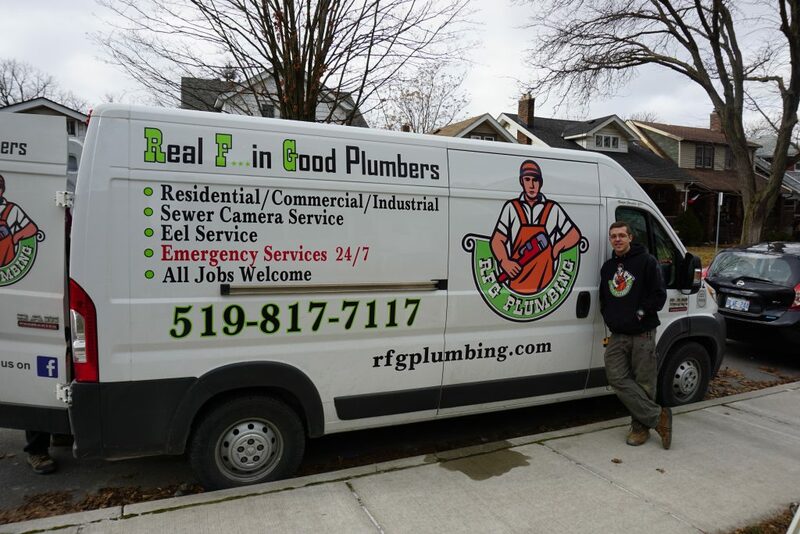 Ryan – is a Plumber Apprentice with RFG Plumbing in Windsor. We got the opportunity to ask him about his career journey as he installed a new laundry room sink in a Walkerville home. 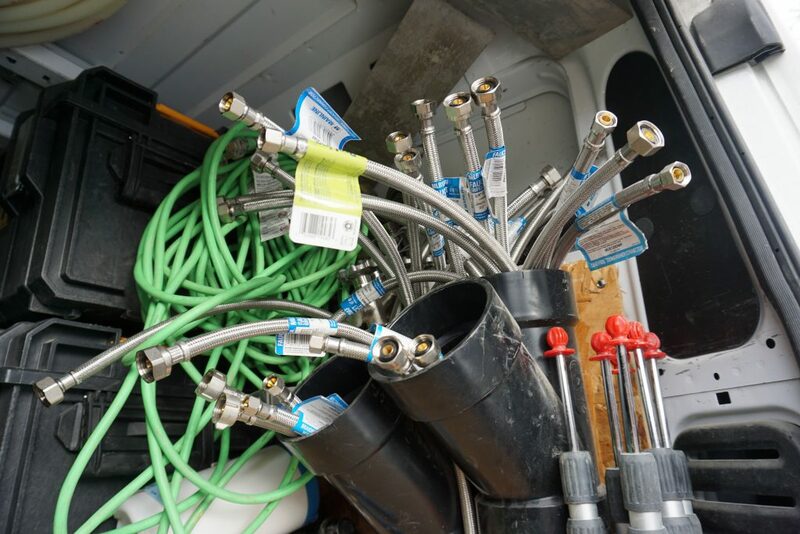 RFG Plumbing has been in business 3 years, has 12 employees, and is starting an electrical division. How long have you been in the job and what got you into this career? I grew up around the trade, seeing how things get fixed. My dad is a plumber, so is my uncle, my cousins, my grandfather, and great-grandfather. Plumbing is in my blood. Even when I was a very young kid my dad brought me along on jobs, and now I bring my son to some jobs with me. My son is 5 and he’s learning the parts, seeing what we’re doing, and seeing that his dad works hard. I get to do the same thing my dad did, and carry on the love of trades in my family. I took a co-op placement with a plumber in high-school. After high-school, I went to the plumbing program at St. Clair College. For the program I had to complete 9000 hours of on the job training, over 4 years. The in-class school was 3 sessions, 8 weeks each time. I really enjoyed the hands on learning. The best part is that you get to watch and learn from your journeyman. In my case, that was my dad. I’ve enjoyed this job more and more every day. I’ve really been enjoying working hard and helping to grow this business. It’s great knowing that we’re the people that can come help resolve people’s problems. I get to meet a lot of really cool people, and I get to have a new adventure every day. There is always work as a plumber- always something to work on and someone to help. As a plumber I get to work a wide variety of jobs- sometimes its service jobs- going into people’s houses and solving a problem like replacing a seal in the tank of the toilet, or switching out someone’s laundry room sink. Could be unclogging drains or fixing a leak in a pipe. But there are other days that we’re breaking up cement and installing a sump-pump. I could be helping someone build their dream bathroom, or dream kitchen. The days constantly change, it just depends on the day. With plumbing, the same plumber that’s working on your house, can work on industrial buildings, or in factories. 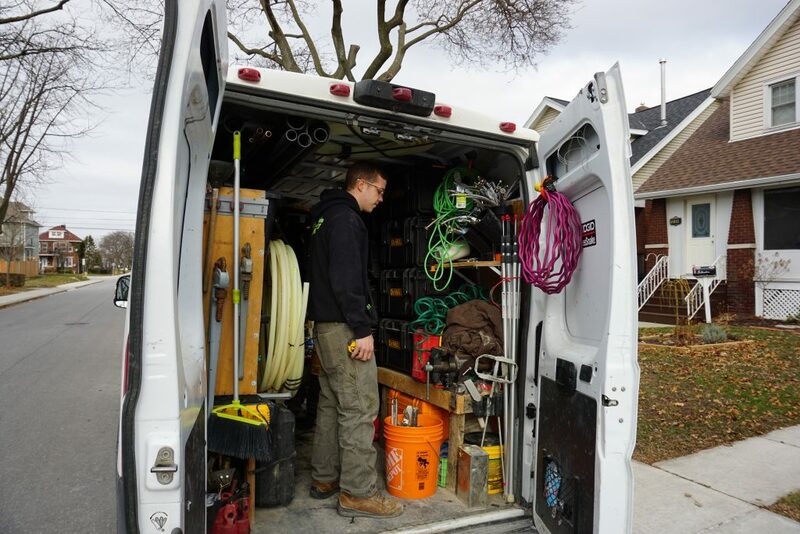 The job is extremely versatile, and plumbers work a wide variety of jobs, and that keeps things really interesting. I would say that the best part the job is solving peoples plumbing problems and seeing their appreciation, but also having self-pride knowing I used my skills and my abilities to successfully fix something. Something I really love about my job is that I’ve fixed and serviced things that my dad’s installed 30 years ago. They used to put the old company’s logo sticker up when they were done, and I’ve seen it while working and taken a photo of it. “Look dad, look grandpa, you were here”. Code and regulations change, so I’m in there updating things, and servicing things, and maybe my son will be doing the same in 15 years. It’s challenging when you think a job is going to be easy or simple, and it’s just not like what it seems. For example- a customer needed a new shut off valve for their water meter, we cut out the galvanized piping, and put a new valve in, re-piped it with copper. Unfortunately, what ended up happening was because they were now getting a better/stronger flow of water, the flow made her fill value in the toilet to stop working and it cause a cartridge issue on one of the faucets downstairs. So now I was in the position of creating a problem by solving a problem. And that doesn’t look great to the customer. 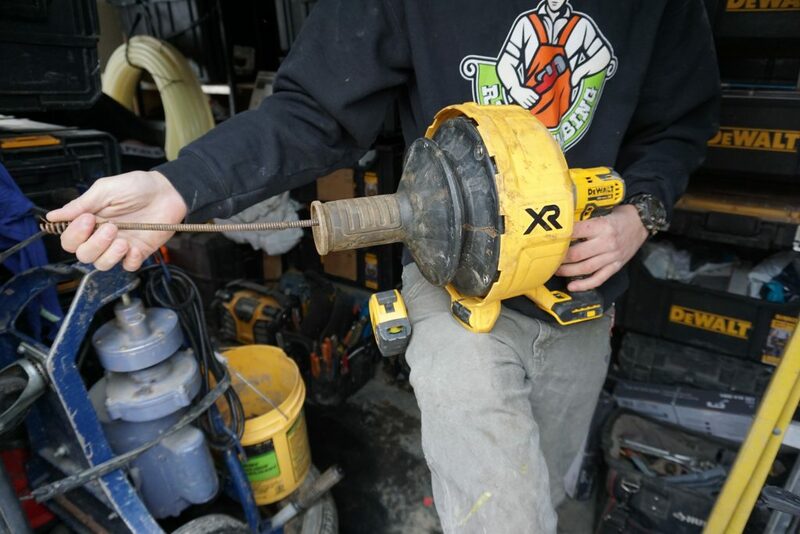 Was something we could not help because with galvanized piping, the material that was used back in the day, you get a lot of sediment build up, and that’s going to create a problem. 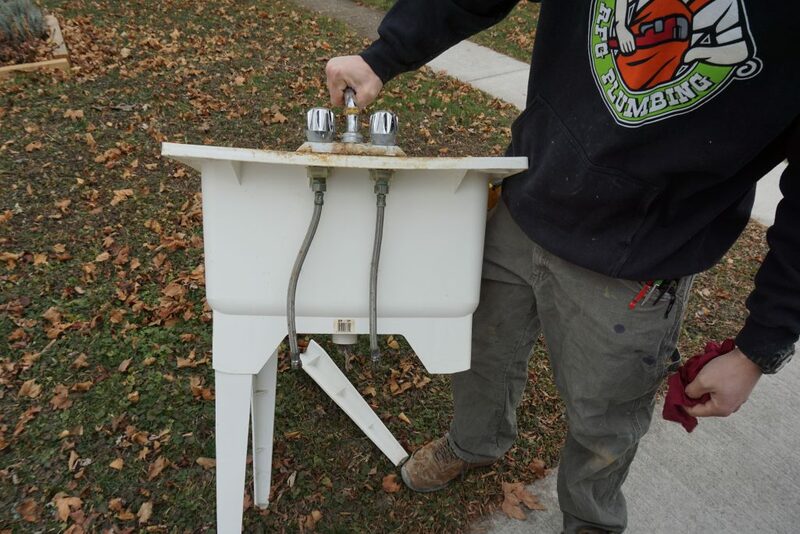 The improved flow takes chunks of rust from the older pipes and causing block-ups in fill-valves and faucets. Depending on the customer that can be a real challenge if they don’t understand. But it’s also a positive –I can fix one thing here, and be able to be prepared and know what other problems I’m going to have to solve. I like anticipating the problems based on my knowledge and experience. The customer appreciates the honesty, and the skill. Is this a career you see yourself in long term? do you think this is a trade that will continue to be in-demand? I will 100% be doing this for the rest of my life. I’m always going to be a plumber, wither I’m working for myself, or for somebody else, I’m always going to be doing this. Plumbing will never go away. Sure, an average person can go to Home Depot, and buy some materials, and try to go home and do things themselves. But a lot of people end up making more problems that they need us to solve. Plumbers will always be needed. For the backwater valve and sump pump, you need a certified, licensed plumber to touch those. Things are always breaking, materials aren’t made to last anymore. Faucets, water lines, everything has a life expectancy. Something I’m installing today, might last 50 years, but in 50 years we’re going to need that next generation of plumbers in here working on this again. For high-school students, I recommend taking co-op whenever possible. Try out a trade, and see if it’s for you, because you never know unless you try. Most guys never think they’ll work as a plumber, but they end up loving it. Nothings worse than scrambling for a job out of high-school. Try out different paths if you need to, but I do highly suggest working in a trade. It’s a feeling of pride to work with your hands and fix something for someone who needs help, is like no other feeling. Having the skill and ability to fix your own plumbing problems- and not have to call somebody, is a really great thing. I’m able to help out my friends and family and save them a lot of time and money. It’s really rewarding to use the skills I have. What’s the biggest thing you’ve learned working in this role? I learned that I don’t give up no matter what, I’m always determined to find a solution. If I don’t know how to do something, I’ll call up one of the more experienced guys if needed. The less experienced workers also know that they can call on me anytime, and I’ll help them out. We’re all there for each other, this is a great shop. If I’m not willing to take the time to train the apprentices, how am I supposed to expect them to be a great plumber? You have to make them feel valued. Treat people the way you want to be treated. The other day I had to change a lens for an automatic flushometer- I had never done that before, I wasn’t 100% sure how to do it. I said to the apprentice who was working with me- pay attention to what I’m doing, and let’s figure this out. I showed him my thought process and why we were trying what we’re trying. Often times, the apprentice may have seen another journeyman work on this- or learned about it in school, and they’re able to help out. You have to give everyone a chance, people will surprise you. There is so much work out there, it’s not like we’re competing for jobs. 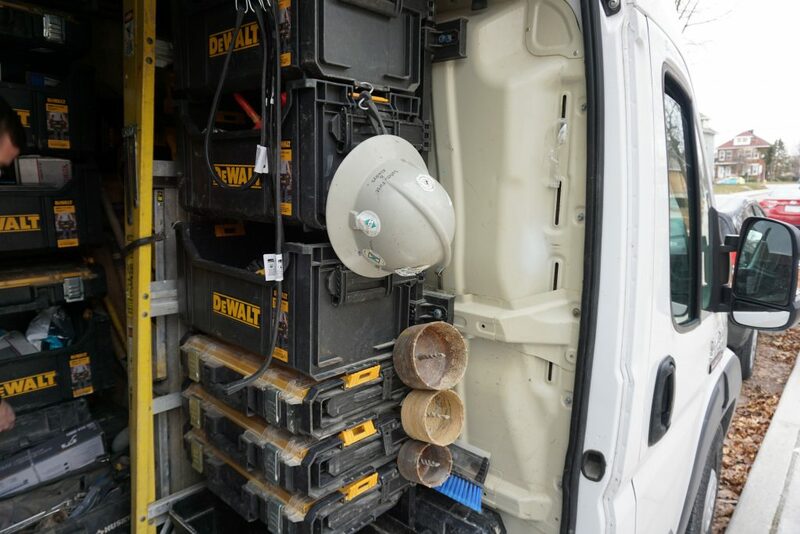 Like my grandpa and my dad always said “If you’re a good tradesperson, there will always be work”. You can learn even more about Plumbers through our detailed Career Profiles. Are you a female working in the trades or hoping to? Looking for some advice from Women in the trade, or looking to mentor young girls? Join our Facebook Group: Windsor-Essex Women in Skilled Trades to get tips for the trades, advice, and answers to all the questions you’ve always wanted to ask!